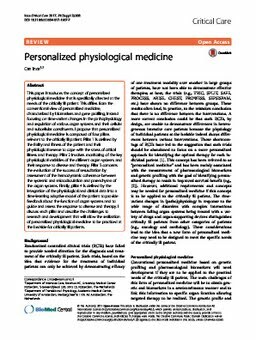 This paper introduces the concept of personalized physiological medicine that is specifically directed at the needs of the critically ill patient. This differs from the conventional view of personalized medicine, characterized by biomarkers and gene profiling, instead focusing on time-variant changes in the pathophysiology and regulation of various organ systems and their cellular and subcellular constituents. I propose that personalized physiological medicine is composed of four pillars relevant to the critically ill patient. Pillar 1 is defined by the frailty and fitness of the patient and their physiological reserve to cope with the stress of critical illness and therapy. Pillar 2 involves monitoring of the key physiological variables of the different organ systems and their response to disease and therapy. Pillar 3 concerns the evaluation of the success of resuscitation by assessment of the hemodynamic coherence between the systemic and microcirculation and parenchyma of the organ systems. Finally, pillar 4 is defined by the integration of the physiological and clinical data into a time-learning adaptive model of the patient to provide feedback about the function of organ systems and to guide and assess the response to disease and therapy. I discuss each pillar and describe the challenges to research and development that will allow the realization of personalized physiological medicine to be practiced at the bedside for critically ill patients.